May 06 – Showcase @ Dazibao Circolo Arci, Tortona (Italy). 08 Dec – w/Lion D & Bizzarri Sound @ C.S. Cantiere, Milano. 05 JAN – RAPHAEL ls PUSHMAN @ Replay, Foggia. 17 JAN – RAPHAEL showcase @ C.s. Fornace, Milano. 31 JAN – RAPHAEL & GROOVE YARD @ Circolo Randal, Sestri Levante (GE). 07 FEB – LIGURIA REGGAE ALL STARS TRIBUTE TO DENNIS BROWN @ C.S. Pinelli, Genova. 13 FEB – GENERAL DEGREE + RAPHAEL & ASHAM BAND @ Petrol, Antwerp (Belgium). 28 FEB – RAPHAEL Showcase opening ROMAIN VIRGO @ Latte+, Brescia. 06 MAR – “SONGS OF FREEDOM” documentary + RAPHAEL, VITO WAR, RISING HOPE @ Circolo Xanadù, Como. 07 MAR – RAPHAEL showcase @ Blu Train Club, Poggibonsi (SI). 14 MAR – RAPHAEL showcase @ Cinema Vekkio, Corneliano D’Alba (CN). 19 MAR – RAPHAEL showcase @ Roots Club, Murcia (Spain). 20 MAR – RAPHAEL showcase @ Casa Pekas los Escullos, Almeria (Spain). 21 MAR – RAPHAEL showcase @ Sala Vive le Rock, Malaga (Spain). 28 MAR – RAPHAEL showcase @ Karpagunea, Legorreta(Spain). 04 APR – RAPHAEL showcase @ East(er)Rock Festival, RGO Arena, Lienz (Austria). 05 APR – RAPHAEL & FIREMAN CREW @ Stadtwerkstatt, LINZ (Austria). 08 APR – STEEL PULSE + RAPHAEL & Groove Yard @ Laboratorio Sociale, Alessandria. 09 APR – RAPHAEL & EAZY SKANKERS @ Hootananny – Brixton, London (UK). 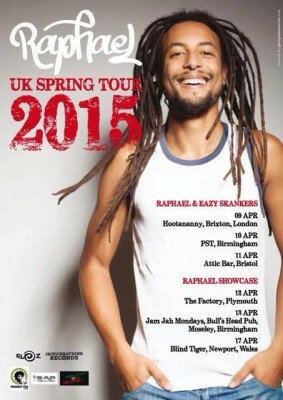 10 APR – RAPHAEL & EAZY SKANKERS @ PST, Birmingham (UK). 11 APR – RAPHAEL & EAZY SKANKERS @ Attic Bar, Bristol (UK). 12 APR – RAPHAEL showcase @ The Factory, Plymouth (UK). 13 APR – RAPHAEL @ JAM JAH MONDAYS, Bull’s Head Pub, Moseley, Birmingham (UK). 17 APR – RAPHAEL SHOWCASE @ Blind Tiger,Newport, Wales (UK). 18 APR – RAPHAEL & FIREMAN CREW @ Loft, Balingen (Germany). 25 APR – RAPHAEL showcase @ Hendaya, Basque Country (Spain). 29 AUG – RAPHAEL & ASHAM BAND @ SMILE FESTIVAL, Antwerp (Belgium). 03 JAN – RAPHAEL & BIZZARRI SOUND @ Caruso, Papozze (RO). 04 JAN – LION D , RAPHAEL, KG MAN, BIZZARRI SOUND, STEVE GIANT @ New Age, Roncade (TV). 09 JAN – RAPHAEL & Eazy Skankers feat. Andy Mitoo @ Hootananny – Brixton, London (UK). 10 JAN – RAPHAEL & Eazy Skankers feat. Andy Mitoo + Friendly Fire Band @ Hare & Hounds, Kings Heath, Birmingham (UK). 11 JAN – RAPHAEL & RAMBOY SELECTA @ The Queens Head, Bristol (UK). 17 JAN – RAPHAEL Acoustic Trio @ Jamaica Happy Pub, Sanfrè (CN). 18 JAN – RAPHAEL & EAZY SKANKERS feat. Andy Mittoo @ La Talpa e l’ Orologio , Imperia. 23 JAN – RAPHAEL Acoustic Trio @ Osteria del vino cattivo, Cairo Montenotte (SV). 25 JAN – RAPHAEL & EAZY SKANKERS feat. Andy Mittoo @ Cinema Vekkio, Corneliano d’Alba (CN). 31 JAN – BESKA ROOTS FOUNDATION + Special guest RAPHAEL @ Bob Marley Tribute – Phenomenon, Fontagneto d’Agogna (NO). 01 FEB – RAPHAEL & DJ PRINZY @ Los Amigos, Andora (SV). 15 FEB – GROOVE YARD 15th B-Bash : Gladiators feat. Droop Lion, + Rankin’ & Friends @ C.s.o.a. TDN , Genova. 22 FEB – RAPHAEL showcase @ Decibel, Magenta (MI). 28 FEB – RAPHAEL & EAZY SKANKERS feat. Andy Mittoo @ OHIBò , Milano. 15 MAR – RAPHAEL & EAZY SKANKERS feat. Andy Mittoo @ El Barrio, Torino. 22 MAR – RAPHAEL & EAZY SKANKERS feat. Andy Mittoo @ Circolo Arci Calamita, Reggio Emilia. 11 APR – RAPHAEL showcase @ Mariella, Montegranaro (FM). 19 APR – RAPHAEL showcase @ Karemaski, Arezzo. 21 APR – RAPHAEL & Eazy Skankers feat. Andy Mittoo @ MareBlu, Borgta Marina (CH). 03 MAY – RAPHAEL showcase @ Maktub, Madeira (Portugal). 10 MAY – RAPHAEL showcase @ RISING LOVE, Roma. 16 MAY – RAPHAEL & Groove Yard Sound @ Asilo Occupato , l’Aquila. 23 MAY – RAPHAEL – & Overjam Riddim Band @ Dvorec, Maribor (Slovenia). 24 MAY – RAPHAEL & Overjam Riddim Band @ Reigen, Vienna (Austria). 30 MAY – RAPHAEL & Eazy Skankers @ Mink, Tolmin (Slovenia). 31 MAY – RAPHAEL & Eazy Skankers @ Bleimaika Reggae Festival, Bleiburg (Austria). 06 JUN – RAPHAEL showcase @ Yacht Style, Imperia. 08 JUN – RAPHAEL showcase @ Parco Forlanini, Milano. 13 JUN – RAPHAEL showcase @ Sabbio Summer Festival, Sabbioneta (MN). 14 JUN – RAPHAEL @ Reno Splash, Marzabotto (BO). 20 JUN – RAPHAEL @ Circolo Mezcal, Savigliano (CN). 21 JUN – RAPHAEL & Eazy Skankers @ Festa della Musica, Pinerolo (TO). 22 JUN – RAPHAEL & Mr. Rez @ Bunarfest, Prizren (Kosovo). 26 JUN – RAPHAEL & Overjam Riddim Band @ Stazione Rogers, Trieste. 27 JUN – RAPHAEL showcase @ Vrhnika (Slovenia). 03 JUL – RAPHAEL & Eazy Skankers @ Fattoria di Vigheffio, Collecchio (PR). 04 JUL – RAPHAEL & Eazy Skankers @ Moonasterock, Vaprio D’Adda (MI). 05 JUL – RAPHAEL & Eazy Skankers @ Porto Vecchio Festival, Zona TAVELLO, Limena (PD). 06 JUL – RAPHAEL Showcase @ Spiaggia Barricata, Scardovari (RO). 10 JUL – RAPHAEL & Eazy Skankers @ One Love Festival, Lignano (UD). 11 JUL – RAPHAEL & Eazy Skankers @ Klein-Winterheim (Germany). 12 JUL – RAPHAEL showcase @ Reggaeland Festival, Plock (Poland). 15 JUL – RAPHAEL & Eazy Skankers @ Rugby Sound Festival, Parabiago (MI) OPENING KY-MANI MARLEY. 16 JUL – RAPHAEL & Eazy Skankers @ Ambria Music Festival, Ambria (BG) OPENING ANTHONY B . 17 JUL – RAPHAEL showcase @ Gros, San Sebastian – Basque Country (Spain). 18 JUL – RAPHAEL & Eazy Skankers @ Lago Verde, San Vincenzo (LI). 19 JUL – RAPHAEL & Eazy Skankers @ Taverna Da Boe Festival, Castel dell’Aquila (TN). 25 JUL – RAPHAEL showcase @ Corto Maltese, Cagliari. 26 JUL – RAPHAEL showcase @ Exit, Klagenfurt (Austria). 27 JUL – RAPHAEL & Eazy Skankers @ Almen Jam Festival, Almenno San Bartolomeo (BG). 01 AUG – Raphael & Eazy Skankers @ Ciao Luca Festival, Gradisca (GO). 02 AUG – RAPHAEL & Eazy Skankers @ Frogland, Levate (BG). 08 AUG – Makako Jump ft. RAPHAEL + Jahcoustix @ Mandstock Festival, ARCO (TN). 14 AUG – Zibba & Raphael “Double Trouble” feat. Bunna @ Banano Tsunami, Genova. 16 AUG – with BIZZARRI SOUND, Lion D @ Maktub Paúl Do Mar, Madeira (Portugal). 17 AUG – with Bizzarri sound , Lion D @ Pé na Água, Madeira (Portugal). 19 AUG – RAPHAEL & Eazy Skankers @ Rototom Sunsplash Showcase Club , Benicassim (Spain). 22 AUG – with Bizzarri Sound @ Uprising reggae festival, Bratislava (Slowakia). 23 AUG – with Lion D & Livity Band @ Sarcedo Summer Fest, Sarcedo (VI). 29 AUG – RAPHAEL showcase @ Soul Dread, Estado de Mexico (Mexico). 30 AUG – RAPHAEL showcase @ Cultural Roots, Ciudad de Mexico (Mexico). 03 SEP – RAPHAEL showcase @ El Roots Cafè, Mazatlan (Mexico). 04 SEP – Mike Diaz Experience meets RAPHAEL @ El Roots Cafè, Mazatlan (Mexico). 06 SEP – RAPHAEL showcase @ Hunga Jungla, Guadalajara (Mexico). 12 SEP – RAPHAEL & EAZY SKANKERS @ Jam It Festival, Bolzano. 13 SEP – RAPHAEL SHOWCASE @ Castelletto Music Garden, Settimo (MI). 20 SEP – HIGH VIBES feat. RAPHAEL @ VITO WAR B-BASH, Ohibò, Milano. 24 SEP – RAPHAEL & EAZY SKANKERS @ Pinelli, opening to TARRUS RILEY, Genova. 26 SEP – RAPHAEL & FIREMAN CREW @ Riddim Bar, Telfs (Austria). 27 SEP – RAPHAEL & FIREMAN CREW @ WUK , Vienna (Austria).03 OCT – RAPHAEL Acoustic Trio @ Movida, Alassio (SV). 04 OCT – RAPHAEL & Bizzarri Sound@ T-I Sound B-day bash, Living Room, Lugano (Switzerland). 05 OCT – RAPHAEL & Bizzarri Sound @ Porticciolo Roots Bar, Torre S. Andrea (LE). 11 OCT – RAPHAEL, BUJUMANNU, ROOTSMAN I showcase @ Seven, Carbonia (CA). 17 OCT – RAPHAEL & Eazy Skankers @ VIBRA, Modena. 24 OCT – RAPHAEL showcase @ Backstage, Munich (Germany). 25 OCT – RAPHAEL & Eazy Skankers @ FRICK, Meck (Switzerland). 01 NOV – RAPHAEL, GENERAL GOOD, I-TREES SOUND showcase @ Brancaleone, Roma. 07 NOV – RAPHAEL @ Love & Fyah Festival, SALA DREAMS, Santa Cruz de Tenerife, Canary Islands (Spain). 14 NOV – RAPHAEL, SHANTY SOUND showcase @ MAI VISTO, Sedrina (BG). 21 NOV – RAPHAEL showcase @ Aquila Nera, Dolceacqua, Ventimiglia (IM). 22 NOV – RAPHAEL showcase @ ASKATASUNA, Torino. 28 NOV – RAPHAEL & EAZY SKANKERS @ Buddha Cafè, Mondovi (CN). 29 NOV – RAPHAEL showcase @ CORONA CLUB, San Salvatore Monferrato (AL). 06 DEC – RAPHAEL & BIZZARRI SOUND @ Artèria, Bologna. 07 DEC – CHEZIDEK, RAPHAEL @ Kavka Jc, Anversa (Belgium). 12 DEC – RAPHAEL SHOWCASE @ Full Music, Firenze. 20 DEC – RAPHAEL & GROOVE YARD @ Mercatini di Natale, Genova. 27 DEC – RAPHAEL & EAZY SKANKERS @ SONAR, Siena. 28 DEC – RAPHAEL SHOWCASE @ Premiere Club, Enna. 29 DEC – RAPHAEL SHOWCASE @ C.s. ex Carcere, Palermo. 31 DEC – RAPHAEL & GROOVE YARD @ Giardini Luzzati, Genova. 11 JAN – RAPHAEL & EAZY SKANKERS @ IDEAL, Magenta (MI). 30 JAN – RAPHAEL LS TOUGHEST SOUND @ Bashment in the Basement – La Cantina , Pavia. 08 FEB – RAPHAEL @ MUMJA CLUB, Tirana (Albania). 09 FEB – LRY ALL STARS PETER TOSH TRIBUTE @ C.s. Pinelli , Genova. 15 FEB – RAPHAEL Ls GROOVE YARD @ Lucrezia, (GE). 22 FEB – RAPHAEL Ls GROOVE YARD @ Sestri Levante (GE). 23 FEB – RAPHAEL & EAZY SKANKERS @ C.S. PINELLI (GE). 02 MAR – PRESENTAZIONE DISCO ATPC – Lapsus, Torino. 09 MAR – RAPHAEL LS CALIGULA SOUND @ Decibel, Ancona. 16 MAR – RAPHAEL & DJ VALE @ SPY CLUB , Bra (CN). 25 MAR – RAPHAEL Ls JAM JAH SOUND @ BULLS HEAD, Birmingham (UK). 28 MAR – RAPHAEL & FRIENDLY FIRE BAND @ HOOTANANNY, Brixton – London (UK). 30 MAR – RAPHAEL & EAZY SKANKERS @ SOLELUNA, Albisola (SV). 31 MAR – DOUBLE TROUBLE @ SACRIPANTE, Ala di Stura (TO). 05 APR – RAPHAEL @ ULTIMA SPIAGGIA, Albisola (SV). 06 APR – Tu Shung Peng B.Day Bash, Pisa. 13 APR – RAPHAEL & EAZY SKANKERS @ REBELDIA , Pisa. 20 APR – RAPHAEL Ls. DJ Prinzy @ Andora (SV). 24 APR – DOUBLE TROUBLE feat. BUNNA @ RESISTENZA & SOLIDARIETA’, Music for peace, Genova. 30 APR – RAPHAEL Ls GROOVE YARD SOUND @ LE BALADIN , Cuneo. 04 MAY – RAPHAEL @ C.S. FORNACE, Rho, Milano. 18 MAY – RAPHAEL ls FANATICS CREW S.S. @ Casale monf.to (CN). 29 MAY – RAPHAEL E REGG’ADDICTED @ Fronte del porto, Savona. 31 MAY – RAPHAEL E REGG’ADDICTED @ La cantina dei frati , Sassello (SV). 01 JUN – RAPHAEL & EAZY SKANKERS @ Festa Privata , Torino. 4 JUN – DOUBLE TROUBLE feat. BUNNA @ Music for Peace , Genova. 14 JUN – RAPHAEL & EAZY SKANKERS @ Sbirrando, Calusco d’Adda (BG). 19 JUN – RAPHAEL ACOUSTIC TRIO @ Fronte del Porto, Savona. 21 JUN – RAPHAEL ACOUSTIC TRIO @ Movida, Alassio (SV). 23 JUN – DOUBLE TROUBLE @ Just Around Rock, Cherasco (CN). 27 JUN – RAPHAEL & EAZY SKANKES @ Reggae in piazza, Alba (CN). 28 JUN – RAPHAEL Ls GROOVE YARD SOUND @ Talamini Cafè, Bra (CN). 29 JUN – RAPHAEL @ Riddim ‘N’ Rhymes, Bosco Albergati, Modena. 05 JUL – RAPHAEL TRIO @ UltimaSpiaggia, Albisola (SV). 06 JUL – DOUBLE TROUBLE feat. BUNNA @ Collisioni Festival, Barolo (CN). 12 JUL – RAPHAEL @ EASTROCK FESTIVAL, Lienz (Austria). 13 JUL – RAPHAEL @ Angeli sotto le stelle festival, Novello (CN). 14 JUL – RAPHAEL & EAZY SKANKERS @ Ambria (BG). 19 JUL – RAPHAEL & EAZY SKANKERS @ Nuvolari , Cuneo. 20 JUL – DOUBLE TROUBLE @ Rock Beach Volley, Bergamo. 23 JUL – RAPHAEL & DJ PRINZY @ Bodeguita de la Playa, Andora (SV). 26 JUL – RAPHAEL @ MEDIOJAMAICANO Festival, Fordongianus (OR). 27 JUL – RAPHAEL e DJ VALE @ FISH AND LOVE Afro Reggae Festival, Lago Villar Pellice. 28 JUL – DOUBLE TROUBLE @ Festa Sant’Anna, Castelnovo (LC). 01 AUG – RAPHAEL & EAZY SKANKERS @ Jamrock Festival, Vicenza. 02 AUG – RAPHAEL TRIO @ Public, Celle Ligure (SV). 03 AUG – RAPHAEL Ls LA COSCA @ Puntabella, Cogoleto (GE). 09 AUG – RAPHAEL @ Emergency Reggae Night – White beach – Steccato di Cutro (KR). 12 AUG – AEL@ POSITIVE RIVER PARTY, Parco dellla Vita, Castelvecchio (PU). 13 AUG – RAPHAEL & EAZY SKANKERS @ Jamming festival Hyrpinia, Casalbore (AV). 14 AUG – LION D + RAPHAEL + BIZZARRI @ WADADA FESTIVAL, Marina di Carrara (MC). 15 AUG – RAPHAEL @ OVERJAM REGGAE FESTIVAL, Tolmino (SLO). 16 AUG – RAPHAEL & EAZY SKANKERS @ Notte Bianca, Finale Ligure. 17 AUG – RAPHAEL & EAZY SKANKERS @ Festival Osteria del Cicchio, Avigliano Umbro (TR). 23 AUG – RAPHAEL & GROOVE YARD SOUND @ AQA CLUB, Genova. 26 AUG – ZIBBA + Double Trouble feat. BUNNA + RAPHAEL & the Eazy Skankers + Rankin’ Fabio @ Soleluna , Albisola (SV). 31 AUG – RAPHAEL @ FALTERONA REGGAE CAMP, Stia (AR). 01 SEP – RAPHAEL @ BOMBOMATT Summerend festival, Dolzago (LC). 04 SEP – RAPHAEL & EAZY SKANKERS @ Almenno Rock, Almenno (BG). 04 OCT – RAPHAEL @ GIANDUIA REGGAE EXPLOSION # CHAPTER 1, Las Vegas Club, Torino. 11 OCT – RAPHAEL Showcase @ Alternatywa Caffe, Barlinek, Poland. 12 OCT – RAPHAEL Showcase @ Alter Ego, Szczecin, Poland. 19 OCT – RAPHAEL & EAZY SKANKERS @ Afterlife Live Club, Perugia. 08 NOV – RAPHAEL & BIZZARRI SOUND @ Vibra , Modena. 10 NOV – RAPHAEL @ Annecy, France. 29 NOV – RAPHAEL Showcase @ Qualuude, Genova. 30 NOV – DOUBLE TROUBLE FT. BUNNA @ Raindogs House, Savona. 01 DEC – RAPHAEL & EAZY SKANKERS @V3Day. P.zza Vittoria, Genova. 06 DIC – RAPHAEL & EAZY SKANKERS @ Latte + , Brescia. 07 DIC – RAPHAEL @ B’Aires Pub, Brembilla (BG). 11 DEC – RAPHAEL Showcase @ OverJam Party, Trieste. 13 DEC – RAPHAEL & ZIBBA @ Movida, Alassio. 14 DEC – RAPHAEL Showcase @ ASKATASUNA, Torino. 20 DEC – RAPHAEL Showcase @ Rootz Klab , Napoli. 21 DEC . RAPHAEL Showcase @ The Cave, Montegranaro (FM). 25 DEC – RAPHAEL & LA COSCA @ Raindogs, Savona. 27 DEC – RAPHAEL & GROOVE YARD SOUND @ OPEN BALADIN , CINZANO (CN). 28 DEC – RAPHAEL & GROOVE YARD SOUND @ Area 51, Alessandria. 31 DEC – CAPODANNO LIGURIA REGGAE YARDIES @ P.zza del Carmine, Genova. 10 FEB – MACRO MARCO + RAPHAEL + JUNIOR SPREA, DREAMA, PUPPIES @ GHOST CLUB , Genova. 11 FEB – ZIBBA & RAPHAEL ” DOUBLE TROUBLE” @ Pinelli (GE) . 18 FEB – ZIBBA & RAPHAEL ” DOUBLE TROUBLE” feat. BUNNA @ SACRIPANTE , Ala di Stura (TO). 23 FEB – RAPHAEL & EAZY SKANKERS @ C.S.O.A. LEONCAVALLO, Torino . 24 FEB – ZIBBA & RAPHAEL ” DOUBLE TROUBLE” feat. BUNNA @ MALE CLUB, Parma . 25 FEB – ZIBBA & RAPHAEL ” DOUBLE TROUBLE” feat. BUNNA @ ARCI SVOLTA, Rozzano (MI). 03 MAR – RAPHAEL LS REGGADDICTED SOUND + SNAUZER SOUND @ CAVA DEL GRIBON , Vado Ligure (SV) . 16 MAR – ZIBBA & RAPHAEL ” DOUBLE TROUBLE” feat. BUNNA @ OFFICINE CORSARE, Torino. 17 MAR – RAPHAEL @ DJ SMILE BIRTHDAY BASH, Urban Club, Genova. 30 MAR – RAPHAEL & GROOVE YARD SOUND @ Vida Loca, Cosseria (SV). 31 MAR – ZIBBA & RAPHAEL ” DOUBLE TROUBLE” feat. BUNNA @ CINEMA VEKKIO, Corneliano d’ Alba (CN). 07 APR – RAPHAEL & EAZY SKANKERS @ Soleluna Beach, Albisola Marina (SV). 08 APR – ZIBBA & RAPHAEL ” DOUBLE TROUBLE” feat. BUNNA @ Norman, Perugia. 13 APR – RAPHAEL & EAZY SKANKERS @ Sonic Alchemist – QBA Alternative Club, Alessandria. 20 APR – RAPHAEL & EAZY SKANKERS @ VIBRA, Modena. 22 APR – ZIBBA & RAPHAEL ” DOUBLE TROUBLE” feat. BUNNA @ La Claque , Genova. 24 APR – KYMANY MARLEY & BAND + RAPHAEL Ls SELECTA FREDO @ Pala Cep , Genova. 25 APR – THE CHAIN GANG hosting RAPHAEL @ CAMPOMORONE , Genova. 28 APR – RAPHAEL & EAZY SKANKERS @ Danza del Lavoro Sporco 2012 – X edizione – c/o Proloco Calliano (AT). 30 APR – RAPHAEL & EAZY SKANKERS @ Beat Cafè, San Salvo (CH). 05 MAY – ZIBBA & RAPHAEL ” DOUBLE TROUBLE” feat. BUNNA @ NEW BULL DOG PUB, Serra Riccò (GE). 06 MAY – RAPHAEL & EAZY SKANKERS @ UN SORRISO NEGLI OCCHI, Prana Lounge, Albisola (SV). 12 MAY – RAPHAEL & EAZY SKANKERS + TWISTED FAMILY @ La talpa e l’orologio, Imperia. 19 MAY – RAPHAEL & EAZY SKANKERS @ Lab AQ 16 , Reggio Emilia. 25 MAY – RAPHAEL & EAZY SKANKERS @ Festa di bagnarola – Sesto al Reghena (PN). 26 MAY – GROOVE YARD – CUFFA SOUND + RAPHAEL @ Ragga Coi Cinghiali Tour, Nuvolari, Cuneo. 03 JUN – ZIBBA & RAPHAEL ” DOUBLE TROUBLE” feat. BUNNA @ Sassello (SV). 04 JUN – ZIBBA & RAPHAEL ” DOUBLE TROUBLE” feat. BUNNA @ Music for Peace, Genova. 09 JUN – RAPHAEL & EAZY SKANKERS @ CINEMA VEKKIO, Corneliano d’ Alba (CN). 10 JUN – RAPHAEL e DJ PIDDU @ Giornata Antirazzista, Saluzzo (CN). 16 JUN – BIZZARRI & FRIENDS : BRUSCO + FIDO GUIDO + RAPHAEL @ Bosco Albergati, Castelfranco Emilia (MO). 22 JUN – RAPHAEL & EAZY SKANKERS @ Junifest, Monsters of ronk, Ronco Scrivia (GE). 23 JUN – RAPHAEL & EAZY SKANKERS @ Young’n’Town, Albino (BG). 29 JUN – RAPHAEL & EAZY SKANKERS @ Notte Bianca, Loano (SV). 30 JUN – RAPHAEL @ Eastrock Festival, Lienz, Austria. 06 JUL – RAPHAEL Ls DJ AFGHAN @ HIGH FOUNDATION FESTIVAL, Ferrara. 07 JUL – RAPHAEL Ls DJ AFGHAN @ BAGNO TROCADERO , Lido Spina (FE). 11 JUL – ZIBBA & RAPHAEL ” DOUBLE TROUBLE @ Essaouira, Albenga (SV). 13 JUL – ZIBBA & RAPHAEL ” DOUBLE TROUBLE @ Prana, Albisola (SV). 14 JUL – RAPHAEL & EAZY SKANKERS @ COLLISIONI , Barolo (CN). 15 JUL – ZIBBA & RAPHAEL ” DOUBLE TROUBLE” feat. BUNNA @ Lago Verde, San Vincenzo (LI). 19 JUL – ZIBBA & RAPHAEL ” DOUBLE TROUBLE” feat. BUNNA @ Festa della Leva , Canale (CN). 20 JUL – RAPHAEL, ASKALA SELASSIE & BIZZARRI SOUND @ TATTI FESTIVAL (GR). 21 JUL – RAPHAEL ls BIZZARRI SOUND @ SOUTH VIBES FESTIVAL, Albania. 22 JUL – MR. VEGAS + MELLOW MOOD + RAPHAEL @ GOA BOA 2012, Villa Serra , Genova. 26 JUL – ZIBBA & RAPHAEL ” DOUBLE TROUBLE” feat. BUNNA @ Festa della birra, Almenno (BG). 27 JUL – ZIBBA & RAPHAEL ” DOUBLE TROUBLE” feat. BUNNA @ Lavagna (GE). 29 JUL – RAPHAEL & EAZY SKANKERS @ Poggio Molesta, Poggio San Marcello (AN). 31 JUL – RAPHAEL ls ROOTZ FLAVA @ Bistrot dei sognatori, Alba (CN). 02 AUG – ZIBBA & RAPHAEL ” DOUBLE TROUBLE” feat. BUNNA @ Capotorre, Celle Ligure(SV). 03 AUG – RAPHAEL & EAZY SKANKERS @ Ferrara Music Park, Ferrara. 05 AUG – SKATALITES + THE MARCIELLOS + RAPHAEL @ C.S.O.A. TDN , Genova. 08 AUG – RAPHAEL & EAZY SKANKERS @ Murata Street Sound, Arce (FR). 09 AUG – RAPHAEL & EAZY SKANKERS + BUNNA @ Fuori Porto, Porto Turistico di San Salvo (CH). 10 AUG – RAPHAEL @ Raggamuffin Warriors festival Camping S.Paolo, Capo Rizzuto (CR).11 AUG – RAPHAEL & EAZY SKANKERS @ Sacripante, Ala di Stura (TO). 14 AUG – RAPHAEL ls LA COSCA @ Punta Bella, Cogoleto (GE). 15 AUG – ZIBBA & RAPHAEL ” DOUBLE TROUBLE” @ Spotorno (SV). 17 AUG – ZIBBA & ALMALIBRE + special guest RAPHAEL @ Soleluna Beach, Albisola (SV). 18 AUG – RAPHAEL & EAZY SKANKERS @ Pollage Rock Festival, Marina di Carrara (MC). 21 AUG – THE CHAIN GANG meets RAPHAEL @ Notte Bianca, Celle Ligure (SV). 25 AUG – RAPHAEL & EAZY SKANKERS @ A Piedi Nudi – EcoFesta Santalucese, Santa Luce (PI). 29 AUG – RAPHAEL & EAZY SKANKERS @ Birreria Falò , Lesegno (CN). 31 AUG – ROOTICAL FOUNDATION + RAPHAEL, PIERO DREAD, SUN SOOLEY @ Positive River, Mezzani (PR). 01 SEP – RAPHAEL & EAZY SKANKERS @ Reset Festival – Parco del Piave di Fener, Alano di Piave (BL). 07 SEP – RAPHAEL Ls. DJ ROBERT outta Up-Beat Lovers @ Oblò Cafè, Ventimiglia (IM). 08 SEP – RAPHAEL Ls. GROOVE YARD @ UNDERGROUND DANCEHALL HEROES , Piazza Dante, Genova. 14 SEP – RAPHAEL Ls. GROOVE YARD @ 185slm – Montagnetta di San Siro – Milano. 15 SEP – LION D – RAS TEWELDE – RAINA – RAPHAEL & THE LIVITY BAND @ Asolo Free Music Festival, Asolo (TV). 19 SEP – ZIBBA & RAPHAEL ” DOUBLE TROUBLE” feat. BUNNA @ Alessandria. 21 SEP – ZIBBA & RAPHAEL ” DOUBLE TROUBLE” feat. BUNNA + GROOVE YARD @ Rifugio Pratorotondo, M.te Beigua (SV). 22 SEP – RAPHAEL & EAZY SKANKERS @ Castello di Dolceacqua (IM). 11 OCT – KALAFREEKA FAMILY meets RAPHAEL @ ARTERIA, Bologna. 16 NOV – GENERAL LEVY + RAPHAEL @ Reggae Club, Neo262, Genova. 17 NOV – RAPHAEL & EAZY SKANKERS @ Karemaski, Arezzo. 30 NOV – RAPHAEL LS GROOVE YARD @ C.S. GABRIO, Torino. 07 DEC – RAPHAEL LS DJ PRINZY @ The Dreamers – Borgo Foce, Imperia. 08 DEC – RAPHAEL Showcase @ Open Season, Prato Nevoso (CN). 14 DEC – RAPHAEL Showcase @ Vida Loca, Cosseria (SV). 21 DEC – LION D, RAPHAEL, RAS TEWELDE & LIVITY BAND @ VIBRA, Modena. 22 DEC – RAPHAEL Showcase + SHANTY SOUND + CONCRETE JUNGLE @ CIRCOLO LIBERO PENSIERO, Lecco. 14 JAN – Zibba & Raphael : Double Trouble feat. Bunna @ Circolo Arci Male Club, Parma . 15 JAN – Zibba & Raphael : Double Trouble feat. Bunna @ Palazzo Granaio, Settimo Milanese (MI) . 05 FEB – Zibba & Raphael : Double Trouble feat. Bunna @ C.S.A. La talpa e l’ orologio, Imperia . 23 FEB – Zibba & Raphael : Double Trouble feat. Bunna @ Baladìn, Piozzo (CN). 04 MAR – Raphael & Groove Yard Sound @ C.S.O.A. Ex Mattatoio, Civitavecchia (RM). 05 MAR – Raphael @ THE REGGAE CIRCUS, Acrobax , Roma. 12 MAR – Raphael & Eazy Skankers @ Ortosonico, Giussago (PV). 23 APR – Raphael & Eazy Skankers @ Circolo Magnolia, Segrate (MI). 07 MAY – Raphael & Eazy Skankers @ Ju – Bamboo ( new album CHANGES release party), Savona. 14 MAY – Raphael & Eazy Skankers @ ROTOTOM SUNSPLASH ITALIAN CONTEST FINALS, Circolo Magnolia, Segrate (MI). 21 MAY – Zibba & Raphael : Double Trouble feat. Bunna @ @ Hiroshima Mon Amour, Torino. 27 MAY – Mellow Mood + Raphael guest @ Bagnarola di Sesto al Reghena (PN). 28 MAY – Zibba & Raphael : Double Trouble feat. Bunna @ Appartamento Hoffman, Conegliano (TV). 02 JUN – Raphael & Eazy Skankers @ ROTOTOM SUNSPLASH EUROPEAN REGGAE CONTEST FINALS, Razzmatazz – Barcelona, Spain. 11 JUN – Boom Boom Vibration + Raphael & Eazy Skankers + Raina @ Energetica Festival, Parco la Pinetina – Riotorto, Piombino (LI). 17 JUN – Raphael & Eazy Skankers @ Ausonia, Trieste. 18 JUN – Raphael @ Oblò Cafe – Ventimiglia (IM). 21 JUN – RAPHAEL & Cuffa Sound opening act @ ALBOROSIE and The Shengen Clan , MEP, Sestri Levante(GE). 25 JUN – Raphael & Eazy Skankers @ Reggae Rock Festival – Bussero (MI). 26 JUN – Raphael & Eazy Skankers @ Festafrica, Piazza San Martino, Toirano (SV). 01 JUL – Raphael & Eazy Skankers @ Nuvolari, Cuneo. 02 JUL – Raphael & Eazy Skankers @ Festa del Gerusco – Robecco sul Naviglio, Milano. 06.JUL – Raphael & Eazy Skankers @ @ Eassaouira, Albenga (SV). 09 JUL – Raphael & Eazy Skankers @ Quinto Sound Festival – Quinto (GE). 11 JUL- Raphael & Eazy Skankers @ Bodeguita de la Playa, Andora (SV). 14 JUL – Raphael & Eazy Skankers @ Italia Wave Love Festival – Lecce . 15 JUL- Raphael & Eazy Skankers @ Volerock Festival, Aulla (MC). 16 JUL – Raphael & Eazy Skankers @ Brenna in Levare, Brenna, (CO). 19 JUL – ANTHONY B + MISTA SAVONA + RAPHAEL @ Crazy Bull, Genova. 20 JUL – Zibba & Raphael : Double Trouble @ Bistrò , Mondovì (CN). 22 JUL – ETANA + WARD 21 + Raphael & Eazy Skankers @ Festa del Sole, Pratorondanino, Masone (GE). 28 LUG – Raphael & Eazy Skankers @ Spiaggia 24, Bussana di Sanremo (IM). 29 LUG – Raphael & Eazy Skankers @ Soleluna, Albisola Marina (SV). 30 JUL- Raphael & Eazy Skankers @ Positive vibration – Colfelice (FR). 05 AUG – Raphael & Eazy Skankers @ Green Festival – Altare (SV). 06 AUG – Raphael @ BLACK AND WHITE PARTY , Soleluna, Albisola Marina (SV). 11.AUG – Raphael & Eazy Skankers @ LIBERAlaMENTE Assud Festival, Lavello (PZ). 12 AUG – SHAGGY + Raphael & Eazy Skankers @ GUSTO DOPA AL SOLE FESTIVAL, Stadio comunale , Lecce. 14 AUG – Raphael @ Mediojamaicano Reggae Festival, Pabillonis (Medio Campidano, Sardegna). 15 AUG – DAVID RODIGAN – Raphael & Eazy Skankers @ MusicaW Festival, Castellina marittima (PI). 20 AUG – Raphael & Eazy Skankers @ Ragga coi cinghiali – Bardineto (SV). 23 AUG – AFRICA UNITE + Raphael guest @ ROTOTOM SUNSPLASH, Benicassim(ES). 26 AUG – Zibba & Raphael : Double Trouble @ Castagnole Lanza (AT). 27 AUG – Raphael & Eazy Skankers @ Positive River Festival, Parma. 29 AUG – Raphael & Eazy Skankers @ Caffè Vittoria – Finale Ligure (SV). 31 AUG – Raphael & Eazy Skankers @ Spiaggia 24, Bussana di Sanremo (IM). 03 SEP – Raphael & Eazy Skankers @ Tasso, Toirano (SV). 09 SEP – Raphael & Ganja Farmers Sound @ Azzurro beach, Crevari (GE). 10 SEP – Raphael @ Notte Bianca, Piazza Piccapietra + Piazza della Coccagna, Genova. 14 SEP – Raphael & uP-BeaTS LoVeRS @ Oblò Cafe – Ventimiglia (IM). 17 SEP – Raphael & Eazy Skankers @ MEETHINK , Castelfiorentino (FI). 23 SEP – Raphael & Eazy Skankers @ Ortosonico, Giussago (PV). 24 SEP – Raphael & Eazy Skankers @ Rifugio Prato Rotondo, Monte Beigua (SV). 02 OCT – Raphael @ NIGERIA INDEPENDENCE DAY-51 YEARS CELEBRATION, El Cocco, Bolzaneto (GE). 05 OCT – Raphael & Eazy Skankers @ C.S.O.A. Askatasuna, Torino. 29 OCT – Raphael & Eazy Skankers @ Festa del Raccolto, CSA Pacì Paciana – Bergamo. 31 OCT – Raphael & Rising Hope Sound @ Halloween Reggae Party, AGUAPLANO, Cantù (CO). 11 NOV – Raphael @ “PREMONITIONS RIDDIM” LAUNCH PARTY, Hare and Hounds, Birmingham (UK). 12 NOV – RAPHAEL @ Open The Gate, London (UK). 16 NOV – Raphael & Eazy Skankers @ Le Baladìn, Piozzo (CN). 18 NOV – Raphael @ TRENT’ANNI IN LEVARE NIGHT, AFRICA UNITE & GUESTS – LIVE CLUB, Trezzo D’Adda (MI). 19 NOV – Zibba & Raphael : Double Trouble feat. Bunna @ ARTERIA , Bologna. 25 NOV – Raphael & Eazy Skankers @ Las Vegas Cafe,Viareggio (LU). 26 NOV – Zibba & Raphael : Double Trouble feat. Bunna @ PALAZZO GRANAIO, Milano. 03 DEC – Raphael & Eazy Skankers @ L.S.O.A. Buridda, Genova. 07 DEC – Zibba & Raphael : Double Trouble feat. Bunna @ CHACHAMURI ,Zona Murazzi lato SX , Torino. 09 DEC – Raphael & Eazy Skankers @ Arci TOM, Mantova. 13 DEC – Raphael & Eazy Skankers @ Open Baladìn,Cinzano (AT). 15 DEC – Raphael & Tu Shung Peng @ Ex Wide, Pisa. 17 DEC – Zibba & Raphael : Double Trouble feat. Bunna @ Bloom, Mezzago (MI). 25 DEC – Raphael & Groove Yard Sound @ JUNGLE BELLS, C.s.o.a. Pinelli, Genova. 31 DEC – Raphael @ festa di capodanno – LRY incontra la FESTA del SOLE @ P.zza Dante, Genova. 15 JAN – DAVID RODIGAN + – Raphael & Eazy Skankers @ Blue moon, Genova. 20 FEB – Raphael & Eazy Skankers @ Circolo Matteotti, Sestri Levante (GE). 13 MAR – Raphael & Eazy Skankers @ Vibra (MO). 20 MAR – Raphael & Eazy Skankers @ Ju – Bamboo, Savona. 08 MAY – Eazy Wayne, Jahvani , Raphael & Eazy Skankers @ Ju – Bamboo, Savona. 05 JUN – Raphael & Regg’addicted Sound @ Festa Carlsberg, Fronte del Porto, Savona. 06 JUN – Raphael & Eazy Skankers @ Find the cure Party – BCC – Ceriale, (SV). 12 JUN – Mama Marjas & Michelangelo Buonarroti Band + Raphael & Eazy Skankers @ Rourestock, Roure (TO). 18 JUN – AFRICA UNITE + Raphael & Eazy Skankers@ LuStando Festival – Lu Monferrato (AL). 19 JUN – Raphael & Eazy Skankers @ Festival delle Periferie, Genova. 26 JUN – BLACKOUT JA + RAS ZACHARRI + Raphael & Eazy Skankers @ Festa del sole, Prato Rondanino (GE). 27 JUN – Zibba & Raphael : Double Trouble – Acustic Bob Marley Tribute @ Festa del sole, Prato Rondanino (GE). 30 JUN – Raphael & Eazy Skankers @ Festa dei Popoli – Mondovì (CN). 02 JUL – TOOTS & THE MAYTALS + Raphael & Eazy Skankers @ PalaCEP, Giardini area Pianacci,Pra (GE). 03 JUL – Raphael & Eazy Skankers @ Festa PD – Carcare (SV). 15 JUL – Raphael & Eazy Skankers @ Reggae in piazza, Alba (CN). 17 JUL – Raphael & Eazy Skankers @ Cafè Caprice, Albenga (SV). 23 JUL – Raphael & Eazy Skankers @ Il Covo – Finale ligure (SV). 26 JUL – Raphael & Dj Prinzy @ Spiaggia Borgo Foce, Imperia. 30 JUL – Zibba & Raphael : Double Trouble – Acustic Bob Marley Tribute @ Bagni Aquarium, Moneglia (GE). 06 AUG – MAD PROFESSOR + Raphael & Eazy Skankers @ Pop Festival, Villa Bombrini (GE). 07 AUG – Raphael & Eazy Skankers@ Cafe 101, Noli (SV). 08 AUG – BRUSCO + Lion D , Raphael, Miss Linda & Livity Band @ Vitulano Folk Festival, Vitulano (BN). 10 AUG – Raphael & Eazy Skankers @ Notte Bianca, Finale Ligure (SV). 11 AUG – Zibba & Raphael : Double Trouble – Acustic Bob Marley Tribute @ Il Chiosco, Moneglia (GE). 13 AUG – BITTY MCLEAN + ONE LOVE HP + Raphael & Eazy Skankers @ Etnoforte Festival, Vinadio (CN). 15 AUG – Lion D , Raphael, Miss Linda & Livity Band @ MusicaW Festival, Pisa. 16 AUG – Zibba & Raphael : Double Trouble – Acustic Bob Marley Tribute @ El Ciringuito, Vado Ligure (SV). 21 AUG – Raphael & Eazy Skankers @ Ragga Coi Cinghiali , Bardineto (SV). 22 AUG – Zibba & Raphael : Double Trouble – Acustic Bob Marley Tribute @ Bar Oasi, Chiavari (GE). 26 AUG – Zibba & Raphael : Double Trouble – Acustic Bob Marley Tribute @ Piazza dell’Unicef, Casarza Ligure (GE). 27 AUG – Raphael & Eazy Skankers @ Festa di fine estate, Monte S.Giacomo, Lavagna (GE). 28 AUG – GAPPY RANKS “Put The Stereo On” RELEASE PARTY feat. RAMBOY SELECTA, SKYLION, SAMURAI, BLACKOUT JA, FENOMENO, RAPHAEL @ Open The Gate black culture cafe’, London (UK). 30 AUG – Raphael & Eazy Skankers @ Bodeguita de la playa – Andora (SV). 01 SEP – Raphael & Benni Selector @ “SEGNALI DI VITA A SAVONA” Villapiana (SV). 03 SEP – Raphael & Eazy Skankers @ Barbatrucco, Savona. 04 SEP – Raphael guest of Nyahbingi Band, ” Is now the time ” album release party @ Magnolia Parade, Circolo Magnolia, Segrate (MI). 09 SEP – Raphael & Eazy Skankers @ Botticino Tollera festival, Botticino (BS). 10 SEP – Raphael & Eazy Skankers @ Meeting cafè, Borno (BS). 11 SEP – Raphael & Eazy Skankers @ Oblò Cafe – Ventimiglia (IM). 24 SEP – Zibba & Raphael : Double Trouble – Acustic Bob Marley Tribute @ Barbatrucco, Savona. 03 OCT – Raphael @ NIGERIAN 50th INDIPENDENCE ANNIVERSARY, Le Club, Genova. 08 OCT – Raphael & Regg’addicted Sound @ Fronte del Porto, Savona. 22 OCT – Raphael & Cuffa Sound @ Banano Tsunami, Genova. 23 OCT – Raphael & Eazy Skankers @ Super Enduro, piazza Vittorio Emanuele II, Finale Ligure (SV). 29 OCT – Zibba & Raphael : Double Trouble feat. Bunna @ Ju-Bamboo, Savona. 30 OCT – Raphael & Eazy Skankers @ Csoa Askatasuna,Torino. 18 NOV – AFRICA UNITE + Raphael & Regg’addicted Sound @ BANGARANG ! BlueMoon, Genova. 27 NOV – Blackout Ja , Raphael & Eazy Skankers + Ramboy Selecta @ Ju-Bamboo, Savona. 04 DEC – Raphael & Eazy Skankers @ La Talpa e l’orologio, Imperia (IM). 05 DEC – Zibba & Raphael : Double Trouble – Acustic Bob Marley Tribute @ Bar Oasi – Chiavari (GE). 18 DEC – Raphael & Eazy Skankers @ Lo Spaccio, Cuneo. 31 DEC – NEW YEAR PARTY ( GROOVE YARD, GANJA FARMERS, RAPHAEL + GUESTS) @ LE CLUB, Genova. 22 FEB – COCOA TEA + TURBULENCE + Raphael & Eazy Skankers @ C.S.O.A. Pinelli, Genova. 13 MAR – Raphael & Eazy Skankers @ Selezioni contest 1° Maggio, Milk, Genova. 27 MAR – Raphael & Eazy Skankers @ Selezioni contest 1° Maggio, Milk, Genova. 28 APR – Raphael & Eazy Skankers @ Finali contest 1° Maggio, Circolo degli artisti, Roma. 09 MAY – Raphael & Eazy Skankers @ Patchanka, Montà (CN). 06 JUN – Raphael & Eazy Skankers @ To the foudation album launch party, Cala loca, Cogoleto (GE). 19 JUN – Raphael & Eazy Skankers @ Zena Zuena, Fiera di Genova. 20 JUN – Raphael & Eazy Skankers @ Barbatrucco, Savona. 23 JUN – Raphael & Eazy Skankers @ C.S.O.A. Terra di nessuno, Genova. 17 JUN – Raphael & Eazy Skankers @ Forte Guercio occupato, Alessandria. 07 JUL – Raphael & Eazy Skankers @ Live & Interview LifeGate Radio, Acua club,zona Murazzi, Torino. 09 JUL – Raphael & Eazy Skankers @ Showcase Stage Rototom Sunsplash, Osoppo (UD). 11 JUL – Raphael & Eazy Skankers @ Borberock Festival, Borghetto Borbera (AL). 15 JUL – Raphael & Eazy Skankers @ Bistrò, Mondovì (CN). 18 JUL – Raphael & Eazy Skankers @ Festival delle periferie, Villa Rossi, Genova. 25 JUL – Raphael & Eazy Skankers @ Burning Imperia Festival, Imperia. 30 JUL – Raphael & Eazy Skankers @ Zerofestival, Parco del Tigullio, Lavagna (GE). 06 AUG – EASY STAR ALL STARS + – Raphael & Eazy Skankers @ Filagosto Festival, Filago (BG). 07 AUG – Raphael & Eazy Skankers @ Sagra della frittella, loc. Sottovalle, Arquata Scrivia (AL). 09 AUG – Raphael & Eazy Skankers @ Vittorino Enoteca, Loano (SV).188) 21 AUG – Raphael & Eazy Skankers @ Bar Tumè, Bosio (AL). 29 AUG – Raphael & Eazy Skankers @ Reggae Radio Station Summer Festival – Magnolia Club – Segrate, Milano. 02 SEP – Raphael & Eazy Skankers @ Festa Democratica, Villapiana (SV). 11 SEP – Raphael & Eazy Skankers @ Caffe 101, Noli (SV). 18 SEP – Raphael & Eazy Skankers @ La vida loca, Cosseria (SV). 19 DEC – Raphael & Eazy Skankers @ San Vittore Club, Milano. 26 DEC – Raphael & Eazy Skankers @ Playa de luna, Bergeggi (SV). 04 JAN – Raphael & Eazy Skankers @ Jambalive, Rapallo (GE). 12 APR – Raphael & Eazy Skankers @ Puerto Baracoa, Grosseto. 19 APR – Raphael & Eazy Skankers @ Jambalive, Rapallo (GE). 26 APR- Raphael & Eazy Skankers @ Ju – Bamboo, Savona. 17 MAY – Raphael & Eazy Skankers @ Volley no stop, Cantù (CO). 28 MAY – Raphael & Eazy Skankers @ Campus Universitario, Savona. 30 MAY – Raphael & Eazy Skankers @ Mu, Parma. 31 MAY – Raphael & Eazy Skankers @ Festa del sole, Forte Sperone, Genova. 07 JUN – Raphael & Eazy Skankers @ Punta Bella Beach, Cogoleto (GE). 13 JUN – Raphael & Eazy Skankers @ Jamaika Bar, Pianezza (TO). 28 JUN – Raphael & Eazy Skankers @ Circolo Artisi, Savona. 04 JUL- Raphael & Eazy Skankers @ Cala Loca, Cogoleto (GE). 12 JUL – Raphael & Eazy Skankers @ Borberock Festival, Borghetto Borbera (AL). 18 JUL – Raphael & Eazy Skankers @ Ferrocarril, Imperia. 26 JUL – Raphael & Eazy Skankers @ Bar Tumè, Bosio (AL). 30 JUL – Raphael & Eazy Skankers @ Lungomare, Vado Ligure (SV). 09 AUG – Raphael & Eazy Skankers @ Circolo Matteotti, Sestri Levante (GE). 23 AUG – MEG + – Raphael & Eazy Skankers @ Balla coi cinghiali, Bardineto (SV). 29 AUG – Raphael & Eazy Skankers @ Ottagono, Sestri Levante (GE). 30 AUG – Raphael & Eazy Skankers @ Ferrocarril, Imperia. 05 SEP – Raphael & Eazy Skankers @ DreaminGorilla day, Quiliano (SV). 20 SEP – Raphael & Eazy Skankers @ SMS, Molassana (GE). 03 OCT – Raphael & Eazy Skankers @ Baretto del Leoncavallo, Milano. 18 OCT – Raphael & Eazy Skankers @ Mako Bomboclan, Ventimiglia. 31 OCT – Raphael & Eazy Skankers @ La vida loca, Cosseria (SV). 07 NOV – Raphael & Eazy Skankers @ La yard, forte Castellaccio, Genova. 05 DEC – Raphael & Eazy Skankers @ La vida loca, Cosseria (SV). 12 DEC – Raphael & Eazy Skankers @ Le grotte, Imperia. 13 DEC – Raphael & Eazy Skankers @ Sugar free, Zona Polo 90 , Albenga. 27 DEC – Raphael & Eazy Skankers @ Circolo Matteotti, Sestri Levante (GE). 17 FEB – Raphael & Eazy Skankers @ Fronte del porto, Genova. 23 MAR – Raphael & Eazy Skankers @ Vibra, Modena. 24 APR – Raphael & Eazy Skankers @ P.zza Sisto IV, Savona. 19 MAY – Raphael & Eazy Skankers @ Festa del Chieti Calcio, Chieti. 26 MAY – Raphael & Eazy Skankers @ Casale Monferrato (AL). 15 JUN – Raphael & Eazy Skankers @ Cala Loca, Cogoleto (GE). 23 JUN – Raphael & Eazy Skankers @ Raindogs, Savona. 24 JUN – Raphael & Eazy Skankers @Festa dell’unità, Savona. 29 JUN – Raphael & Eazy Skankers @ Alpignano (TO). 30 JUN – Raphael & Eazy Skankers @ Asti summer nights, Palaghiaccio , Asti. 01 JUN – Raphael & Eazy Skankers @ African Arts Festival , Genova. 05 JUL – JUNIOR KELLY + Raphael & Eazy Skankers @ Goa Boa festival, Genova. 13 JUL – Raphael & Eazy Skankers @ TwentyOne, Loano (SV). 14 JUL – Raphael & Eazy Skankers @ Komplikazione Festival, Bosio (AL). 26 JUL – Raphael & Eazy Skankers @ Milkout festival, Parco della Lanterna, Genova. 03 AUG – Raphael & Eazy Skankers @ Punta Bella Beach, Cogoleto (GE). 04 AUG – Raphael & Eazy Skankers @ Giardini Colombo, Vado Ligure (SV). 09 AUG – Raphael & Eazy Skankers @ Il Pitosforo, Carbonia (CA). 10 AUG – Raphael & Eazy Skankers @ Santiago Pub, Abbasanta (OR). 11 AUG – Raphael & Eazy Skankers @ The Garage, Suelli (CA). 12 AUG – Raphael & Eazy Skankers @ Vacaloca, Loc. Porto Pino, Sant’Anna Arresi (CA). 13 AUG – Raphael & Eazy Skankers @ Corto Maltese, Cagliari. 16 AUG – Raphael & Eazy Skankers @ Santiago Pub, Abbasanta (OR). 17 AUG – Raphael & Eazy Skankers @ Zi Antò Pub, La Maddalena (OT). 18 AUG – Raphael & Eazy Skankers @ Honky Tonk Cafè, Valledoria (SS). 19 AUG – Raphael & Eazy Skankers @ Mizar, Loc. Li Giunti, Badesi (SS). 01 SEP – Raphael & Eazy Skankers @ Daubaci, Vado Ligure (SV). 02 SEP – Raphael & Eazy Skankers @ Cala Loca, Cogoleto (GE). 07 SEP – Raphael & Eazy Skankers @ Area Concerti, Fiera del Mare, Genova. 13 DEC – Raphael & Eazy Skankers @ Ju – Bamboo, Savona. 20 JAN – Raphael & Eazy Skankers @ Ju – Bamboo, Savona. 03 FEB – Raphael & Eazy Skankers @ 3joli , Varazze (SV). 04 FEB – Raphael & Eazy Skankers @ C.s.o.a. Pinelli, Genova. 17 MAR – Raphael & Eazy Skankers @ Dopo Le Otto,Celle Ligure (SV). 14 APR – Raphael & Eazy Skankers @ 3Joli , Varazze (SV). 27 MAY – Raphael & Eazy Skankers @ Concerto per Giorgio, lungomare di Arenzano (GE). 03 JUN – Raphael & Eazy Skankers @ Zona Franka, Casale Monf.to (AL). 10 JUN – Raphael & Eazy Skankers @ Il Bastione, Genova. 24 JUN – Raphael & Eazy Skankers @ Cala Loca, Cogoleto (GE). 30 JUN – Raphael & Eazy Skankers @ Cuneo . 12 JUL – Raphael & Eazy Skankers @ Arezzo Wave , Stadio Comunale, Arezzo. 15 JUL – Raphael & Eazy Skankers @ Komplikazione Festival, Bosio (AL). 07 AUG – Raphael & Eazy Skankers @ Musicamondo, Altare (SV). 13 AUG – Raphael & Eazy Skankers @ Soleluna Beach, Albisola (SV). 18 AUG – Raphael & Eazy Skankers @ Corto Maltese, Cagliari. 19 AUG – Raphael & Eazy Skankers @ Magic Sunset, Villaputzu (CA). 20 AUG – Raphael & Eazy Skankers @ Honky Tonk Cafè, Valledoria (SS). 22 AUG – Raphael & Eazy Skankers @ DLF, Cagliari. 23 AUG – Raphael & Eazy Skankers @ Blue Delly, Calasetta (CI). 16 SEP – Raphael & Eazy Skankers @ Milano film festival, Milano. 22 SEP – Raphael & the Midnight Skankers (Midnight Ravers + Eazy Skankers) @ Ju-Bamboo, Savona. 21 OCT – Raphael & Eazy Skankers @ C.S.O.A. Terra di nessuno, Genova. 31 OCT – Raphael & Eazy Skankers @ El Rubio, Savona. 01 NOV – Raphael & Eazy Skankers @ Concerto per Dani, Circolo Milleluci, Savona. 11 NOV – Raphael & Eazy Skankers @ Corte dei Miracoli, Siena. 06 DEC – Raphael & Eazy Skankers @ Aggabachela, Sassari. 07 DEC – Raphael & Eazy Skankers @ Blackout, Lanusei (OG). 08 DEC – Raphael & Eazy Skankers @ Transilvania (CA). 09 DEC – Raphael & Eazy Skankers @ Honky Tonk Cafè, Valledoria (SS). 29 DEC – Raphael & Eazy Skankers @ Ju – Bamboo, Savona. 08 JAN – The Blue Young Monkeys + Raphael & Eazy Skankers @ Face, Albisola (SV). 22 JAN – Raphael & Eazy Skankers @ Killer’s Inn Pub, Cosseria (SV). 19 MAR – Raphael & Eazy Skankers @ “Rock targato Italia” , Milk, Genova. 27 MAR – Raphael & Eazy Skankers @Rototom Sunsplash Reggae Contest – Babilonia, Ponderano (BI). 29 APR – Raphael & Eazy Skankers @ Ju – Bamboo, Savona. 30 APR – Raphael & Eazy Skankers @ c.s.o.a. Pinelli, Genova. 06 MAY – Raphael & Eazy Skankers @ Rototom Sunsplash Reggae Contest Finals, Auditorium Flog, Firenze. 14 MAY – Raphael & Eazy Skankers @ Patchanka, Montà d’Alba (CN). 20 MAY – Raphael & Eazy Skankers @ Fiumi di Birra,Ponte da Elsa (FI). 08 JUL – KEN BOOTHE + BLACK UHURU + EARL 16 + GAUDI’+ Raphael & Eazy Skankers @ Rototom Sunsplash, Osoppo, Udine. 15 JUL – Raphael & Eazy Skankers @ Festa de l’Unità, Savona. 16 JUL – Raphael & Eazy Skankers @ NuvolariLiberaTribù, Cuneo. 25 JUL – Raphael & Eazy Skankers @ Asti Summer Nights, Palaghiaccio, Asti. 13 AUG – Raphael & Eazy Skankers @ Dopo Le Otto,Celle Ligure (SV). 14 AUG – Raphael & Eazy Skankers @ Bagni Cormorano, Spotorno (SV). 16 AUG – Raphael & Eazy Skankers @ Dancing Aurora, Valleggia (SV). 20 AUG – Raphael & Eazy Skankers @ Angolo Bar, Cogoleto (GE). 03 SEP – Raphael & Eazy Skankers @ Bornasco reggae festival, Bornasco (BI). 24 SEP – DESMOND DEKKER & THE ACES + Raphael & Eazy Skankers @ c.s.o.a. Pinelli, Genova. 30 SEP – Raphael & Eazy Skankers @ Cala Loca, Cogoleto (GE). 15 OCT – Raphael & Eazy Skankers @ c.s.o.a. Subbuglio, Alessandria. 05 NOV – Raphael & Eazy Skankers @ Arte e Musica – P.zza Sisto IV, Savona. 12 NOV – Raphael & Eazy Skankers @ C.S. Intifada, Ponte a Elsa, Empoli. 16 JAN – OTTO OHM + Raphael & Eazy Skankers @ Ju – Bamboo, Savona. 31 JAN – Raphael & Eazy Skankers @ Puerto Escondido, Savona. 13 FEB – Raphael & Eazy Skankers @ Ju – Bamboo, Savona. 28 FEB – Raphael & Eazy Skankers @ Versus Contest fase 2, Fitzcarraldo, Genova. 11 APR – Raphael & Eazy Skankers @ Rototom Sunsplash Reggae Contest, Jaill, Legnano (MI). 17 APR – Raphael & Eazy Skankers @ Circolo Artisi, Savona. 21 MAY – Raphael & Eazy Skankers @ Versus Contest semifinali, Fitzcarraldo, Genova. 29 MAY – Raphael & Eazy Skankers @ Ju – Bamboo, Savona. 12 JUN – Raphael & Eazy Skankers @ Circolo Artisi, Savona. 04 JUL – Raphael & Eazy Skankers @ Showcase Stage, Rototom Sunsplash, Osoppo (UD). 25 JUL – Raphael & Eazy Skankers @ Circolo Milleluci, Savona. 08 AUG – Raphael & Eazy Skankers @ Circolo Milleluci, Savona. 20 AUG – Raphael & Eazy Skankers @ Festa della birra, Ellera (SV). 22 AUG – Raphael & Eazy Skankers @ Festa di Liberazione, Molo di Varazze (SV). 08 OCT – Raphael & Eazy Skankers @ Jaill, Legnano (MI). 29 OCT – Raphael & Eazy Skankers @ Ju – Bamboo, Savona. 03 DEC – Raphael & Eazy Skankers @ Selezioni “Rock targato Italia”, Takabanda, Varazze (SV). 04 DEC – Raphael & Eazy Skankers @ P.zza Sisto IV, Savona. 23 DEC – Raphael & Eazy Skankers @ Ju – Bamboo, Savona. 22 MAR – Raphael & Eazy Skankers @ Circolo Artisi (punk,ska-reggae,core night), Savona. 11 APR – Raphael & Eazy Skankers @ Orientafest, Ente Scuola Edile, Savona. 12 APR – Raphael & Eazy Skankers @ Music against the war – P.zza Sisto IV, Savona. 17 APR – Raphael & Eazy Skankers @ Sinte Galeskha Pub, Savona. 01 MAY- Raphael & Eazy Skankers @ Aperitivo del Non-Lavoro, Circolo Artisi, Savona. 14 MAY – Raphael & Eazy Skankers @ Music for peace – P.zza Sisto IV, Savona. 02 JUN – Raphael & Eazy Skankers @ Gaudì , Celle Ligure (SV). 03 JUN – Raphael & Eazy Skankers @ Savona beach rockers – P.zza Sisto IV, Savona. 07 JUN – Raphael & Eazy Skankers @ Daubaci, Vado Ligure (SV). 30 JUN – Raphael & Eazy Skankers @ S.M.S. Giardino Serenella, Savona. 03 JUL – Raphael & Eazy Skankers @ Circolo Artisi, Savona. 04 JUL – Raphael & Eazy Skankers @ S.M.S. Giardino Serenella, Savona. 12 JUL – Raphael & Eazy Skankers @ Beer Room, Pontinvrea (SV). 19 JUL – Raphael & Eazy Skankers @ Bagni Sorriso, Albisola (SV). 25 JUL – Raphael & Eazy Skankers @ Circolo Artisi, Savona. 01 AUG – Raphael & Eazy Skankers @ Everybody in the place festivalS.M.S. San Genesio, Valdo Ligure (SV). 09 AUG – Raphael & Eazy Skankers @Komplikazione Festival, Barlettine (AL). 13 AUG – Raphael & Eazy Skankers @ Bagni Lido, Albisola (SV). 15 AUG – Raphael & Eazy Skankers @ Beer Room, Pontinvrea (SV). 21 AUG – Raphael & Eazy Skankers @ “Rock e i suoi fratelli” , Sassello (SV). 29 AUG – Raphael & Eazy Skankers @ Uangabang! Spiaggia libera Mare Hotel, Savona. 30 AUG – Raphael & Eazy Skankers @ Festa de l’UNITà, S.M.S. La Rocca, Legino (SV). 31 AUG – Raphael & Eazy Skankers @ Molo di Varazze (SV). 13 SEP – Raphael & Eazy Skankers @ Festa della birra, Ellera (SV). 03 OCT – Raphael & Eazy Skankers @ Fitzcarraldo, Genova. 24 OCT – GANJAMAMA + Raphael & Eazy Skankers @ Ju – Bamboo, Savona. 08 NOV – Raphael & Eazy Skankers @ Ju – Bamboo, Savona. 19 NOV – Raphael & Eazy Skankers @ Versus Contest, Fitzcarraldo, Genova. 29 NOV – Raphael & Eazy Skankers @ Circolo Artisi, Savona.- Raphael & Eazy Skankers @ Circolo Artisi, Savona. 21 DEC – Raphael & Eazy Skankers @ Ju – Bamboo, Savona.